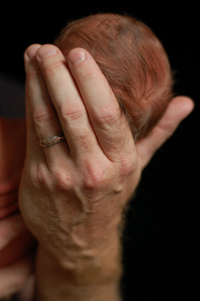 Ginger's snapped this photograph of her husband with their newborn son in 2007. Why do we have to directly experience loss and pain in order to learn how to share the burden of others’ grief? Through the birth and strife of illness with my first son, I learned to share in one another’s joys and sorrows. We may not understand another’s suffering, but we can strive to love greater through expressing compassion for their life circumstance. Our society tries to tell us that we can be independent creatures. However, what has resulted is a society where individuals have entirely isolated themselves from each other – from texting to email to putting newborns into cribs in a room alone to “teach them how to fall asleep on their own.” We were created for relationship with one another, not to be individual creatures completely devoid of need for interaction and relationship with one another. How do we find fulfilling relationships? Remember those who suffer. We must share in the burden of humanity with one another. As women in Afghanistan are suffering and being refused education in many circumstances, other men are dying from fighting wars against their brothers in Africa, while still yet, homeless children are without basic needs such as food and water in Haiti. We must act. Get out there. Travel. You will not have to walk or drive far to find someone in need. Act. Lend your hand and your heart. No matter how small we think our contribution is, we must act. When we share in one another’s burdens, in doing so, we will ease the pain and suffering of everyone, ourselves included, and only then can we share in one another’s joys. Helping others is the surest way to help ourselves. Treating each other reverently, and handling one another as sacred beings – is the surest way to improve our relationships, and our world. What do you find most important in creating fulfilling relationships?